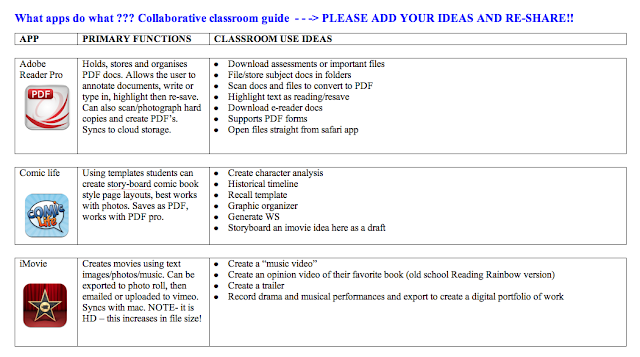 I came across a tweet about iPad apps yesterday from @1moniqued and was impressed with a Google Doc she had started. I thought it might be something that we could crowd source further. I am going to hand over to Monique now so she can explain her concept. As a "self-confessed-geeky-teacher" (aka edu-nerd) I play video games, I own multiple devices (of which I have issues with separation anxiety, but that's normal right? ), I download loads of cool apps on these devices and occasionally, I find a way of connecting these to my classroom content giving me not only an excuse to "play" in the classroom, but to excite my learners and connect the syllabus to stuff they enjoy. The first issue I had however was that I wanted more excuses to do this. I wanted to know MORE ways of integrating apps into my classroom teaching and students learning. The second issue, was that I was purchasing TWO apps that did similar things? This was happening without the experienceto discern between the best option, or after purchasing an app I realised it could not do what I actually wanted it to do in my classroom. THE SOLUTION! (now here is where you can tell I'm a teacher of D&T, every problem has a designed solution right!) I created a GOODLE DOC that tabulated apps, their functionality AND their numerous applications in the classroom being a google doc I could access to from multiple devices, YAY! You want access to this document right? . . . You want to add your fave apps that you use in theclassroom with examples of teaching strategies don't you?. . . You want to share it with your twitter followers and colleagues?! . . .Well, OF COURSE YOU CAN!! A huge thank you to the contributors of this document, their details are on the bottom of the page, add yours too when your done.